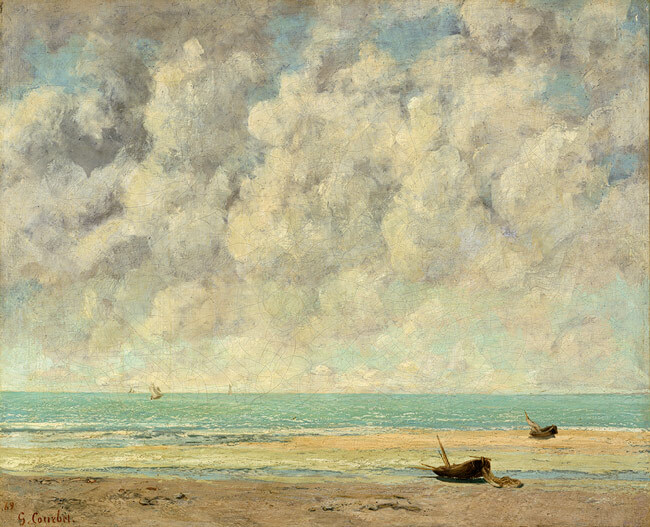 Gustave Courbet was preeminent among the realist painters of nineteenth century France. Although he rejected the romanticism of the previous epoch of painting, there was often a certain robust drama to his paintings—which frequently portrayed dark hunting scenes, stormy waves, and tempestuous mistresses. This painting however is a real exception: here is a delightfully undramatic summer beachscape. Hazy half-cumulus clouds melt into the aqua sky above a yellow strip of sand. Small practical fishing vessels bake in the sun as sailboats drift by on the offing. Although this is a view of the beach as it appeared in the 1860s, there is something timeless about it. In real life the simple painting seems alive with the sounds and sunlight of the Atlantic coast—you almost expect a seagull to fly out of it (hopefully that comes across from the digital image—it is hard to look at art online). Courbet’s work was a bridge not just away from the tempestuous Romantic art of the first half-of the nineteenth century, but towards the liveliness and freedom of impressionism. This simple but powerful work really shows how he could enliven a familiar landscape with bravura brushwork!